Just over ten days ago, as the pro-independence forces in east Ukraine were on the march with significant gains on the battlefield, a ceasefire was signed in Minsk, Belarus. According to the terms of the ceasefire, the pro-independence fighters were to lay down their arms, cease their offensive to regain lost territory in the Donetsk and Lugansk region, and disband. In exchange for this, the US-backed government in Kiev was to agree to an amnesty for pro-independence fighters, commit to economic development in the east, and agree to enshrine decentralization in law to provide autonomy to the east. Most importantly, the ceasefire was to stop the Kiev government's shelling of major population centers in the east and stop the slaughter of military forces on both sides. It turns out to be a grotesque sleight of hand, with Kiev receiving guarantees at the September 5, NATO summit in Wales that NATO members would provide the military equipment to finish the pro-independence forces in the east after the ceasefire gave time to re-group a badly beaten, largely conscript Ukrainian army. Are You Going to LPAC? The Ron Paul Institute for Peace and Prosperity will be flying the peace flag at the Liberty Political Action Conference again this year. If you are interested in Ron Paul, his post-Congress mission to promote peace and prosperity, and the Institute he created, please stop in at the Ron Paul Institute booth at the LPAC exhibition hall. I look forward to meeting as many of you as I can. I want to hear what you think about the Ron Paul Institute and what you think we can do to improve. Most of all, I want you to be a part of our efforts to make the case for non-interventionism overseas and protection of civil liberties at home! Western media has ignored it, but protesters have occupied the Maidan square in Kiev since last October. They were successful in overthrowing the elected president, Viktor Yanukovych, but they didn’t go home. They kept their tents, remained in occupied government buildings, and hunkered down. Boxer-turned-revolutionary Vitali Klitschko was in the thick of the protests at the time, supported by the United States and its Assistant Secretary of State, Victoria Nuland. 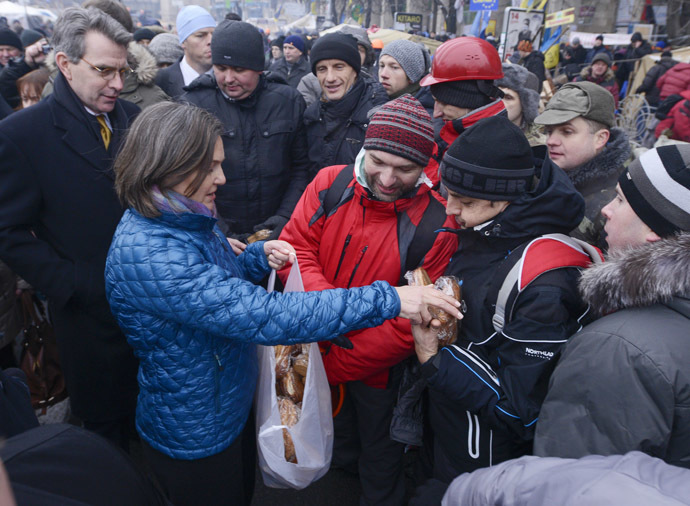 In fact, Nuland posed with protest leaders seeking to overthrow the government – including Klitschko – and even famously went down to the Maidan square to hand out cookies to the protesters. In her infamous intercepted telephone conversation with US Ambassador to Ukraine Geoff Pyatt, Nuland made it clear that the US was behind Klitschko and Arseniy “Yats” Yatsenyuk. When then-President Yanukovych sent police down to the square to break up the violent protests, the US warned him not to crack down on them. Even peaceful moves by the authorities to clear out the square were met with firm US threats of sanctions.